The City of Carlsbad’s Aloha Plunge will take place this year on Saturday, June 24, 2017 at Alga Norte Aquatic Center. 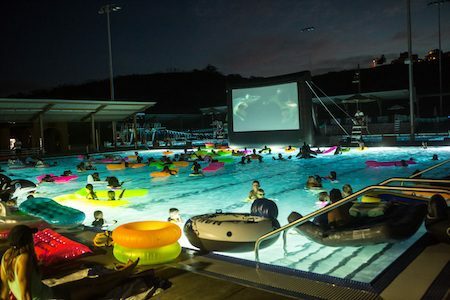 Enjoy fun, island themed pool games and activities and as the sun goes down, finish the night off with a special movie, on the giant outdoor movie screen. · Event begins at 5 p.m. and movie begins at dusk. · Tickets are $10 per person and kids ages 3 and under are free. · Register online or in person at Alga Norte Aquatic Center. · Pick up your wristbands in advance at Alga Norte Aquatic Center to avoid lines. · Enjoy dinner at the Dive In Grill open during the event. Menu includes made-to-order grilled burgers, chicken sandwiches, pizza, shaved ice, ice cream and other tasty treats. No outside food or drinks are allowed. For more details, please follow the jump.